South Houston's Elton Dyer nails a jump shot near the end of the first half against Richardson Pearce. Elton Dyer scored 16 points Thursday morning and 17 more in the afternoon to power South Houston to a first-day Division 2 sweep on the boys side of the McDonald's Texas Invitational. The Trojans, who'll start Gold Bracket play on Friday, bounced Richardson Pearce in their morning opener 56-49 and followed that with a convincing 61-45 victory over Spring Branch Memorial in the afternoon. Both games were played in the Trojans' gym. Nick Hernandez scored 10 points in the first game for the Trojans, now 4-0 for the season. The Pasadena High and Sam Rayburn boys teams enjoyed success on opening day, splitting their pool play games to earn slots in the Division 2 Silver Bracket. The Texans beat La Porte 63-59 and then barely missed joining the Trojans in the Gold Bracket, losing in overtime to Klein Collins 77-67. The loss was Sam Rayburn's first of the season. The Eagles has a similar experience but in the opposite order. Pasadena fell in overtime to Crosby 41-39 to start the day, then topped Klein Oak 58-45. South Houston will take on Klein Collins in the Gold quarter-finals on Friday at noon at the South Houston gym. Should the Trojans win, they'll move to the semifinals at 6 p.m. at the Sam Rayburn gym against either San Antonio Taft or Cinco Ranch. The Dobie and Memorial boys teams both went 0-2 on the first day, landing in the Bronze Bracket. Pasadena ISD girls teams dropped nine of their 10 games. The only breakthrough was Sam Rayburn's 40-33 victory over district rival Memorial at Phillips Gym. Also on the girls side, Division 1 favorite Duncanville extended its Texas Invitational winning streak to 12 games with easy victories over San Antonio Madison and Pearland Dawson. Boys Division 1 favorites Duncanville and Desoto advanced to the Gold Bracket, as did Fort Bend Bush, Lancaster, Pearland, Austin Westlake, North Crowley and Richardson Berkner. Dobie sophomore Jason Lester looks for a pass inside against Humble. Longhorns' point guard Justin Turner works the top of the key against Humble. Dobie's Jonathan Shaw puts up a jumper from the corner against the Wildcats. Pasadena's Corey Martin drives the length of the court for two points in the first half against Crosby. Crosby's Slevon Ross goes high to block a shot by Pasadena's Abram Vallejo. Crosby's Tristan Egans loses the ball as he runs into the defense of Eagles Corey Martin (1) and Bradley Courtney (24). South Houston sophomore Nick Hernandez plays keep-away with Pearce's Travis Groos near the top of the key. The Trojans' Eric Cabrera tries to work his way out of the corner against Pearce. Memorial guard Alex Navarro put up a shot against Flower Mound. Mavericks point guard Ray Tafolla launches an outlet pass against Flower Mound. Anthony Almodovar puts one up against the Jaguars. Texans sophomore Justin Jaramillo brings the ball upcourt against La Porte. Michael Cutler fakes out the La Porte defense for a reverse lay-in. 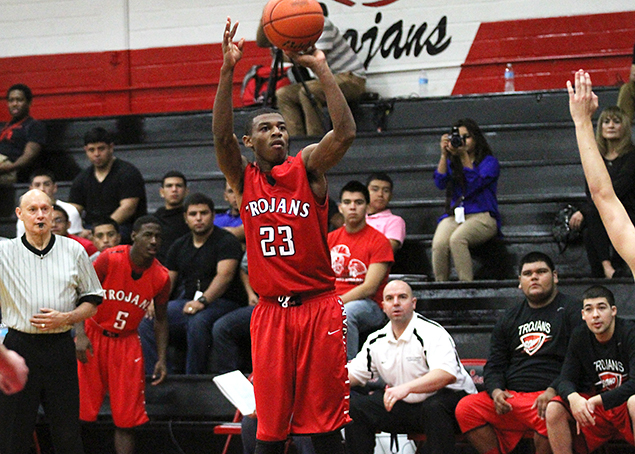 Sam Rayburn guard Brandon Cantu prepares to shoot from the lane against La Porte. Memorial's Kayla Johnson moves inside against Sam Rayburn's Mariah Armelin. Memorial's Keana Sanchez takes it to the hoop against Sam Rayburn. Sam Rayburn's Sabrina Garza drives around Memorial's Molly Huerta. Memorial's Carolina Cisneros passes to Dean Martinez. Sam Rayburn's Sabria Garza (21) collides with Memorial's Molly Huerta (2) and Vanessa Ortego as the ball slips away. Sam Rayburn's Mariah Armelin drives against Victoria East's Ann Grayson Wozniak. Lady Texan defenders Mikayla Meza (15) and Mariah Armelin (23) tri to box out Victoria East's Kendall Carter (30). Sam Rayburn's Sabrina Garza pushed the ball past Victoria East's Jada Whitby. Pasadena senior Angelica Espinoza drives down the lane against Deer Park. Deer Park's Jillian Hacker put up a shot over the Lady Eagles' Daniell Sosa. Pasadena's Kierra Irvin loses control of the ball as she dribbles past Deer Park's Katie Owen. South Houston's Chelsie Decoud crashes the lane against Cy-Creek. Jazmin Calvillo (11) helps set up the zone against Cy-Creek. Cy-Creek 's Jessica Munoz fights for control of the ball as South Houston defenders Ranesha Gibson (23) and Chelsie Decoud (1) apply pressure. Dobie junior Makaela Scott breaks the North Crowley press. Dobie freshman Jade Diron passes the ball over the North Crowley defense. Dobie sophomore Gabrielle Jones takes a steal to the basket against North Crowley.